Mike’s shared hacks at just about every conceivable touchpoint and channel. A dedicated Tumblr offered how-to videos and blueprints (how to make a mini grill out of an empty Mike’s can, how to create a porch mister out of PVC tubing); the brand also placed content on sites including BuzzFeed and Discovery. In-store displays featured seasonal mikehacks as well: backyard and pool-party hacks throughout early and midsummer, tailgate and game-day hacks in late summer and early autumn. An especially eye-catching display was the Grill Barrow, in which a branded wheelbarrow was converted into a barbecue spit for roasting chickens… complete with holders for tucking away a few bottles of Mike’s. Mike’s encouraged people to share their own #mikehacks on the Tumblr page and other social media. It also ran a sweepstakes, giving a trip to Lollapalooza to a random entrant who submitted a photo or video of a hacked floating pool cooler. During the four-month campaign, the Tumblr site received 667,000 page views. 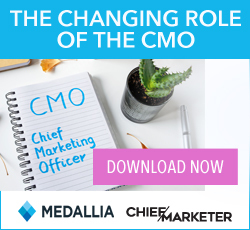 Across its social partners, the videos generated 529,500 completed views. From April through August 2014, average sales volume climbed nearly 80% from the previous three-month period. What’s more, the redemption rates of IRCs ranged from 10% to nearly 20%, compared with the brand’s typical redemption rate of about 2%. 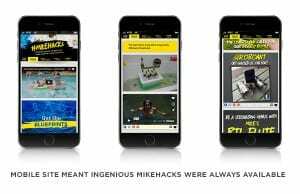 If ever a campaign could be considered a lifehack, Mikehacks is that campaign. 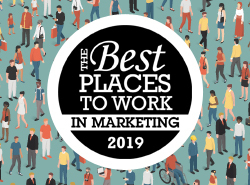 Allied Integrated Marketing Kicking Cow MKTG Aquarius Sports and Entertainment SET HelloWorld, Inc. Blue Chip Marketing Worldwide GMR Marketing Marketing Activations Group Infinity Marketing Team, Inc.